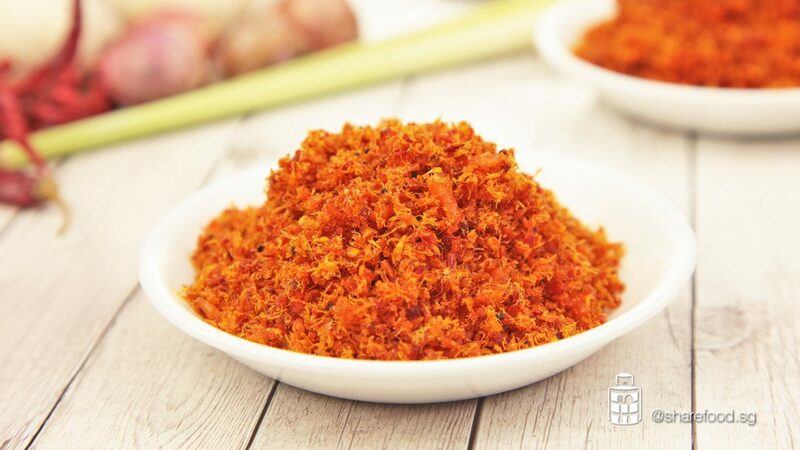 Dried Shrimps Spicy Sambal or better known as Hae Bee Hiam, is a popular dish that Asians love. It can be used almost everywhere! You can go with your plain rice, bread, or even as a condiment to enhance the flavours of your meat and vegetable. That's how good it is! 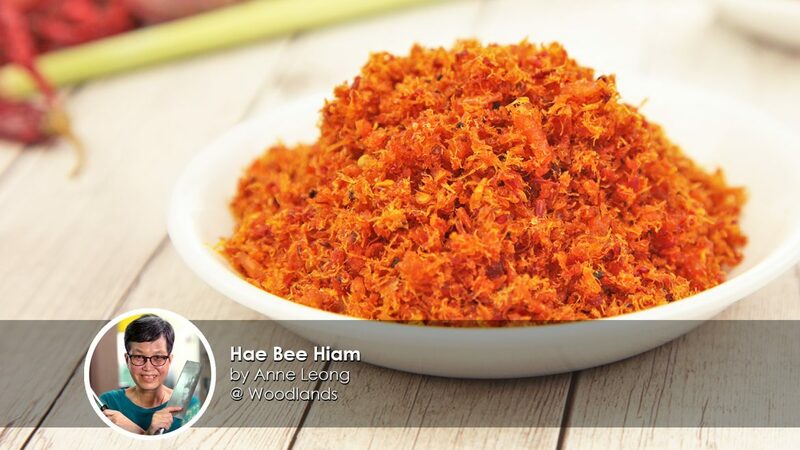 Anne is a veteran home cook and she is very particular when it comes to making her very own Hae Bee Hiam. 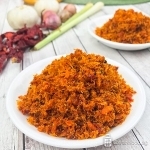 To acheive a consistent fluffy texture and the best flavour, she insist on pounding the dried shrimps using the most traditional method - Pestle and Mortar. We have tried the recipe and we simply love it! And, if you ask us what is Share Food's way of eating, we would say, squeeze a lime to 3 tablespoons of Hae Bee Hiam. The extra zest will leave you wanting more! 200 g dried shrimps soak for 30 mins till it softens. In a bowl, pour in hot water until it covers the chilli. Set aside till it softens. Remove the de-seed red chilli from the bowl. Pour the red chilli and 1 tbsp oil into the blender. Blend till fine. 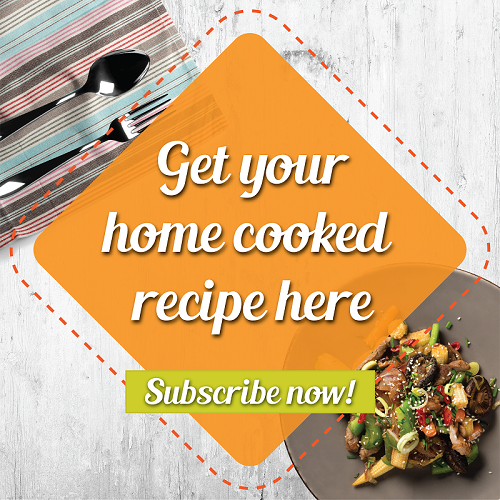 In a separate bowl, blend the remaining ingredients, except the lemongrass, with 2 tbsp oil. Blend till fine. TIP: Blending the red chilli and other ingredients separately will allow the ingredients to be blended to a finer texture. In a frying pan with 3 tbsp oil, pour in the paste and lemongrass. Fry on medium fire until the ingredients changed it’s colour to deep red. If the paste is too dry, add in 1 – 2 tbsp of oil gradually. Add in salt and sugar, fry till the sugar melted. Adjust the taste as desired. Set aside. TIP: If you intend to use this chilli paste as a base to cook other dishes, do not add in too much seasoning as it may affect the taste of other ingredients. In a pestle and mortar, pound dried prawns finely. Scoop and place the pounded dried prawn in a bowl. In a heated pan, add in the pounded prawn. Dry fry till it’s dried. Set aside. In a pan with 4 tbsp oil, add in chilli paste and fry till the oil seeps through. Add in the pounded prawn and continue to fry on medium-low heat. If the paste is too dry, add in 1 tbsp of oil gradually. TIP: Avoid adding too much oil to prevent the Hae Be Hiam from becoming lumpy. Continue to fry till the chilli combines with the dried prawns. Once it has turned brown, add in salt and sugar, adjust as desired. Fry till the sugar melted. Remove from wok and let cool. Allow it to cool completely before storing in the refrigerator or serve.